Editors, Agents and Cavemen, Oh My! People came from as far as Thailand, New Zealand, and Australia. For many readers, this conference was a chance to meet favorite authors, and score some free books in the process. Some attendees enjoyed the drama of dressing up for the costume balls. For published authors, it was an opportunity to attract new fans and chat with old ones. But I was there to meet the editors and agents who could help me establish my career. Although the editor I pitched to did not jump at the chance to publish Ready or Not, she was kind enough to listen to my spiel about The Great Myth Conception and willing to consider that book when it’s completed. As I walked away from my meeting with her, the editor of an e-publishing house asked if I might be interested in publishing electronically. After speaking with the second editor, I am more open to the idea. In addition, I met with an agent who is willing to review my work for possible representation. I came home satisfied with my progress. Of course, there were other attractions. The male cover models were an entertaining bonus. The Ellora’s Cavemen reminded me of a television special I saw once. The program compared male and female reactions to strippers. The men were very intense, as if they would be tested later on the color of the dancer’s g-string and pasties. Women, on the other hand, seemed to find the would-be Chippendales’ antics hilarious. Like them, I found it difficult to keep a straight face. To my relief, the Cavemen chose only Ellora’s Cave authors to entertain on a more, um, intimate level. And, although attending primarily for the educational workshops, I managed to squeeze in a few fun sessions. 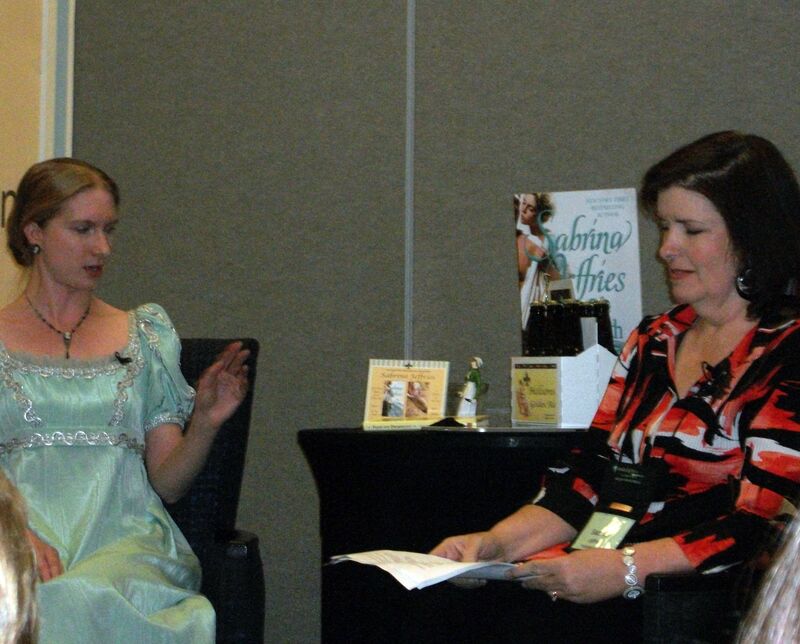 For example, I was there when Jane Austen showed up showed up for Regency bingo with Sabrina Jeffries (The Truth About Lord Stoneville). It seems Jane is none too pleased with the way some people are using her works. Zombies, anyone? At the book fair on Saturday, I chatted with the authors who write contemporary romance and purchased some of their books. After all, if contemps are ever going to stage a comeback, the genre needs to sell! Susan Donovan, Diana Holquist, and Louisa Edwards were among the lovely ladies who encouraged me to stay the course. Since I don’t really think I can write historical or paranormal, I’m not sure I have a choice. Also, after seeing Tessa Dare’s book trailer for her new historical romance trilogy, I had to meet her. She was equally charming and, I discovered, a fellow librarian (always a good sign). If you haven’t seen her video, check it out at http://www.youtube.com/watch?v=c4DzoNkomQ0. It’s so clever; you have to watch it. 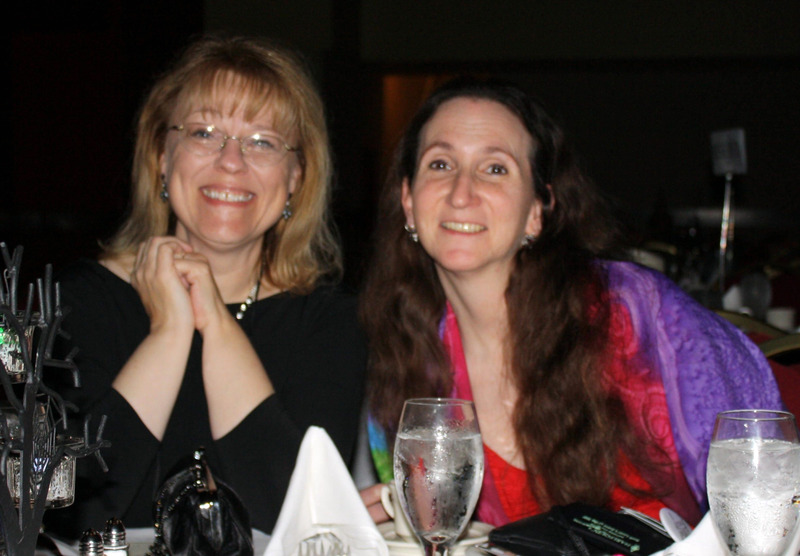 Ann Hinnenkamp, a new friend and author of Dyad Dreams, was kind enough to put up with me for much of the weekend. Here we are at one of the banquets. Barbara Vey and Joysann were also my companions for much of the conference. Now back at work, I’ve been astonished at the number of authors’ names I recognize from the conference. The books seemed to leap off the shelf at me yesterday when I was arranging the romance section. Next week, it’s my own RWA chapter conference and then back to the day-to-day job of writing and querying. Still, finishing Ready or Not and attending these conferences have provided a much-needed break. And my house is clean, at least temporarily, for the first time in months. This entry was posted in Uncategorized and tagged Agents, Editors, Ellora's Cavemen, Leanna Renee Heiber, Mr. Romance 2010, Pitching a romance, Romantic Times Conference, Sabrina Jeffries. Bookmark the permalink.